Owned animals such as goats need to be kept in closures both to protect them from harm and to allow them freedom without wandering off too far and getting lost and that’s where the best goat fence comes in handy. Using a fence is a simple and elegant solution. To save you time and effort, we’ve studied reviews of goat fences as well as expert opinions to show you what some of the most popular products that give you total control over your livestock are. We recommend the Premier ElectroStop electric fence as it is suitable for containing goats, sheep, cattle and at the same time it repels coyotes and bears. The fence’s electrical resistance is of 38 ohms, which is ten times lower than other steel wire electrical fences. Moreover, additional netting sections can be connected later. For additional support, vertical struts are fitted 12 inches apart. The roll is easy to install and the time required for this task is less than 10 minutes. If you do not find this product on sale, we also recommend the Premier ElectroNet electric fence. This product has a low resistance of 38 ohms for every 1,000 feet, is easy to set, and is modular, meaning you can add fence sections later. Vertical struts are places 12 inches apart and prevent sagging and tangling when you are handling the fence. The black and white color design keeps the fence visible at all times. This model is not designed for poultry and if the soil is dry the fence has poor electric conductibility. This electric fence is versatile and is suited for many types of animals. It does a good job keeping your livestock contained and protected. The ElecroNet features a total of 8 electrified strings. The 9th bottom string is not electrified to prevent tall grass from grounding the system. The mesh is impenetrable by pigs, goats, sheep, dogs, and other similar-sized animals. PVC pipes fitted with metal spikes act like posts and are placed at 12-foot intervals. To prevent power drain, you have to regularly trim the grass that grows beneath the fence. If you need a resilient fence that withstands bad weather conditions and protects your livestock, then ElectroNet is the choice for you. This fence is versatile and can be modified with ease by cutting the wires with a wire cutter and reshaping them for any personal project. It can be used for animal enclosures as well as for gardening. Customers have grown vines and vegetables on it or have made bird feeding zones that keep predators like cats out. The welds are not extremely solid, and some of them may come undone during transportation. This fence is not electrified but manages to keep animals out or in. It can be used for more purposes than those animal related so it’s a good buy. Below we have showcased some of the most popular products that customers used based on goat fence reviews. These fences are reliable and have received high marks on review websites. Read the following lines to find out more about the features of these models and decide which fence for sale is the best one for your needs. This electric fence comes with included posts and it’s very easy to install. Its low electrical resistivity means that it has a high sensitivity and will detour any animal that touches it. It keeps your livestock in and predators out. As the wiring pattern used on this model has the holes a little large, you shouldn’t use it for poultry. The fence has a length of 164 feet, a height of 42 inches and features 10 horizontal threads, out of which 9 are electrified. This has the purpose of preventing power drainage into the ground via weed or grass. The PVC posts are 0.6 inches in diameter and feature 6-inch double spikes at the bottom. The product works great when it comes to keeping animals like goats, sheep, pigs, even guard dogs inside its perimeter. You have to acquire the energizer separately. The recommended joule of energizer for every fence roll is 0.25. The product has a low electrical resistivity of 38 ohms which is lower than most steel wire fences. This makes it more effective. This product is modular, meaning that you can add sections of fence later if you decide to expand or modify your enclosure. Vertical struts prevent the fence from sagging and touching the ground. They also come in handy when you roll or unroll the fence because they prevent tangling. The high-contrast color design makes it visible even when the sunlight intensity is low or when the fence is in front of a dark background. Due to the wider holes in this fence, the product is not suited for poultry. These animals will most likely pass through the wire mesh. The electric conductibility of this product is dropping if the ground on which it’s installed becomes dry. This electric fence keeps stray dogs, coyotes or wolves away from your enclosed livestock with ease. The prefabricated fence has a length of 164 feet and a height of 35 inches. Vertical plastic struts give it rigidity and prevent sagging. These are placed 12 inches apart. The product is fitted with 9 horizontal strands out of which the top 8 are electrified. At 12.5-foot intervals, the fence features 0.51-inch PVC pipes. These are built right into the mesh and are fitted at the bottom with 6-inch metal spikes. This fence does not come with an energizer unit, therefore that item must be bought separately. The manufacturers recommend that you should only use intermittent pulse energizers with low or wide impedance. They warn not to use continuous output energizers in combination with wire netting. The product will function best if you use an AC/DC energizer. Regular struts offer the fence good stability, prevent sagging and reduce the chances of it getting tangled when it is installed or moved. More rolls of netting can be connected together in case you need to build a larger enclosure. Because it’s a modular system you can also remove sections later. The posts are included in the package and their metal spikes at the bottom make it easy for you to drive them into the ground for support. The horizontal strand that is placed the nearest to the ground is not electrified as contact with tall grass may cause power drains over time. Tall grass and weed draw power from the fence, therefore maintenance work has to be done regularly by trimming the vegetation at the base of the fence. If the soil has low moisture, the electrical conductibility of the fence drops and therefore it won’t be able to function with the same efficiency. This fence is made from welded wire and is 48 inches tall. The roll has a length of 50 feet and it’s easy to unroll and to install. The wire has a class 1 galvanized zinc coating. This protects the fence against corrosion and gives it durability. This product is versatile and many customers have used it for gardening purposes as well. You can grow vines or tomatoes or other vegetables on it or for pet-proofing. In addition, it can be used to delimitate property boundaries without breaking the bank. The fence has a sturdy enough structure that it stands up by itself. You don’t need additional posts and the product is light enough for old people to move around. This model is made in China. The fence rolls come in 25 feet and 100 feet in length as well. 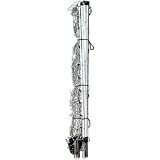 The height varies from 2 feet to 6 feet and the available gauges are 12.5, 14, and 16. The roll is light and does not pose a problem for people with back problems or for older persons who need to move it around and install it. The wire is coated in galvanized zinc, therefore it is resistant to rust even if it sits outdoors under bad weather, such as rain or snow. The fence has a good structural resistance which means you don’t necessarily need additional posts to keep it up straight. This fence has a multitude of uses, such as livestock enclosure, gardening purposes and many other projects around the house. Some welding points can become undone if the fence is not transported or handled correctly. This results in a waste of netting. A few customers received fences that were missing some wires which led to the appearance of large holes in the mesh. The Premier Enhanced electric fence is mainly designed for goats and sheep but works fine with other animals of the same stature as well. It has a green color, which means that it blends in with the background for an aesthetical look. The fence is 40 inches tall and the roll has a length of 120 feet. As the bottom holes are larger, this product is not fitted to be used when building poultry enclosures. This model features 9 horizontal strands out of which the bottom one does not conduct electricity. This is to prevent power from draining into the ground if the fence touches tall grass. Vertical strands are fitted 6 inches apart from one another and the 8 top strands that conduct electricity do so by means of stainless steel wire woven into the polyethylene strands. The horizontal and vertical strands are connected together with plastic beads. Although it is easier to mount this fence on level ground, this fence stays upright even if installed on uneven or inclined terrain. The installation process is very intuitive and doesn’t take long. To unpack and mount this fence you only need about 15 minutes at the most. Every ten feet the fence has posts fitted inside through its net. They are easy to drive into the ground and give stability and support to the fence. If you ever need to expand your enclosure, the fence features power clips at the end so you can later add additional fence sections. The posts are not extremely solid and approximately 2 weeks after installing the fence, customers observed that the posts are slightly bent. This product doesn’t come with an energizer so you will have to buy the unit separately. Manufacturers recommend a Premier Solar energizer. This electric fence is 35-inch tall and 164-foot long. It is suited for enclosing livestock such as goats, sheep or dogs and for repelling predators such as foxes, coyotes and even bears. Because the wiring pattern is a little large, poultry might escape through the fence, therefore manufacturers do not recommend this model for enclosing these animals. The net out of which the fence is built is colored in a bright yellow. This prevents accidental electrocution both for humans as well as for the enclosed animals. Out of the 8 horizontal strands, the top 7 feature conductive stainless steel wire woven into the fabric. The bottom strand is null, meaning that no electrical current passes through it, therefore no loss of power takes place if it touches weed or grass. That being said, it is still a good idea to trim the vegetation around the fence periodically to prevent the system from grounding out. The high visibility colors prevent people and animals from accidentally getting too close to the fence and touching it. At every 13.5 feet, PVC pipes give the fence stability and resistance against mild impact. They can be easily driven into the soil as they are fitted with a metal spike at the bottom. The fence comes carefully rolled and tied. This leads to an easy unpacking experience and a fast installing process. The modular netting allows you to modify and expand the fence whenever you like. You can do this by attaching the new sections to the power clips found at the end of the mesh. Although it is visible both on dark and light backgrounds, the fence doesn’t look extremely good, aesthetically speaking. Customers have had rams that eventually went through the fence because ewes were close by. This fence is not strong enough to withstand strong impact forces. This fence is made from galvanized steel wire, therefore it’s resistant to rust. These wires are welded in a cross pattern for structural strength and are trimmed across the edges so you can install the fence without injuring your palms. The steel used in the making of this model is 16 gauge in diameter and the mesh has a 2 by 1-inch pattern. Other available gauges include 12.5 and 14. A fence like this one can serve various purposes around your home. People use it not only to enclose animals but also to build structures on which vegetables can grow, animal cages or plant holders. This product is ideal for constructing a temporary boundary on your property without spending a lot of money. The fence comes in a roll that is 25 feet in length and 2 feet tall. It is easy to transport around your home and can be installed with ease. The zinc galvanized class 1 wire used to manufacture this fence makes it resistant to corrosion and gives it a long life. The wires are easy to bend and to cut with a wire cutter. This makes the fence versatile and highly adaptable to many household scenarios. The edges are trimmed smooth, therefore the chances of you cutting yourself when handling it are small. Your pets and livestock are also safe when walking near this fence. The roll is light and easy to carry around your yard. You can install it without much effort and move it whenever you like. Some products are not 25 feet long, as they should be. Customers received rolls that were as short as 20 feet. The welding points between the vertical and horizontal wires can be weak. This means that they may come undone if are not transported or handled correctly. This product is 36 inches tall and 50 feet long. It features a wire mesh that has 3 by 2-inch holes. The wires are galvanized to protect the fence from rusting. They are suitable for building cages for animals, or for placing in the garden so that vegetables can grow on them. In addition, they are an inexpensive solution to set some boundaries on your property. The roll is easy to carry around your yard or garden and doesn’t pose any problems for people with back problems. The product can be installed quickly and can be adjusted according to your specific needs by using a wire cutter, by stapling the wire mesh to wood, or by simply bending the fence. The product is built from 16 gauge wire. Although it is light, the fence is sturdy enough to resist the weather and light impact from small sized animals. The fence is pliable and easy to work with. Without cutting your hands you can bend it or cut it to fit any home project you are developing. The wire is coated with galvanized zinc so you can build your fence or other projects and leave them outside without fearing that the wire mesh will rust. The fence is extremely versatile. Customers have used it to build rabbit cages, to make tunnels for cats, to grow vegetables on it, to pet-proof porches, etc. The product is inexpensive, which makes it the perfect solution if you are on a budget and need to come up with something fast. Some customers received the wrong product that was not galvanized and started to rust after a couple of weeks. Small rabbits can pass through the wire mesh and get out of their cage or get in your garden. This welded type wire fence is 100 feet long and has a height of 36 inches. The wire mesh comes in 14 gauge, with a 1 by 1-inch hole pattern. Because the wire mesh is so dense there is no chance that a rabbit or other small animal could escape from its enclosure and get to a garden that is surrounded by this fence model. You can use this fence to build bird or rabbit cages, dog kennels, or to protect medium size livestock. In addition, you can place it in your garden so that vegetables have support on which to grow on. People use it for raised garden beds as well. Customers were very pleased with their purchase and many of them have bought another roll of this fence to expand their work or to start a new project. This heavy-duty fence is sturdy and you will surely use it successfully in any project. The small 1 by 1-inch wire mesh prevents small animals like rabbits or cats from passing from one side to another. This particular fence roll is the longest option from the three sizes available. By acquiring 100 feet of fence you surely will complete your task. The wire is thick and durable. The 14 gauge wire is not easy to bend and proves to be a strong barrier that successfully resists bad weather and low-intensity hits. The wire is galvanized, so you don’t have to worry about it rusting if it sits under bad weather or moisture. Because it has a small mesh, it can be used to build chicken coops. Many other types of fences have the holes too large and poultry can escape through them. Some clients received a different size fence from the same manufacturer, so always check your purchase. However, these occurrences are isolated. This electric fence has a design that allows it to be light and portable. It is extremely good for temporary fencing solutions. It contains 6 strands made of stainless steel. These conduct electrical current with great efficiency. Moreover, the product installs easily and can later be repaired or spliced. Even after splicing, it can be recoiled and used over and over again. This product will not rust and despite the fact that it has a length of 656 feet, it remains lightweight. The bright colors make it visible and prevent people from accidentally electrocuting themselves upon contact. The fact that it’s visible is in the animals’ favor as well. Once they have been shocked once, animals will stay away from the wires, even if they are not energized. The wire is flexible and easy to wrap around posts or clips. A good trick is to use a lighter and melt the ends of the cut wires in order to stop unraveling. The wire is extremely flexible and can be easily rolled, transported, stored, and attached to the posts. The metal wire inside is made of stainless steel but will not rust as the polywire has a braided exterior layer that protects the metal from water. At only 1.2 pounds this wire roll is the perfect solution to be used on the go, or for repairing something on the spot without too much hassle. Because it’s not extremely thick the wire can be easily cut into smaller pieces with a wire cutter or even a pocket knife. High weed or grass causes the voltage through the wire to drop if it comes in contact with it. This lowers the wire conductibility or can cause a fire. Once you have installed this wire over tall vegetation you have to trim the grass periodically. This fence features 4 by 4-inch holes in its mesh, has a height of 48 inches and a length of 100 feet. 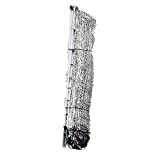 The material used is 12.5 gauge class 1 galvanized steel wire. The edges of this fence are smooth. They have been trimmed to the same level so that no animal can cut itself. The product is designed to flex if it is impacted in order to absorb the force. However, the netting is strong and holds together. The Keystone 70305 is able to protect your livestock from predators such as wolves, coyotes and even bears are kept at bay when they encounter this fence. Besides securing a certain perimeter, you also have the option of using the fence netting to build other projects around your home. People use these fences to build animal cages or they place them in gardens to let vegetables grow on them. The netting provides great support for tomatoes, cucumbers, peas, etc. The fence is very strong and as long as it is secured properly, it withstands the weight of plants or garden vegetables. If the netting is hit, it is able to absorb the force with ease and distribute it so that the mesh remains intact. The edges of this model are smooth so if animals like goats, sheep or dogs run near it, they won’t have they fur or wool snagged in the netting. This model does a good job of keeping unwanted animals out and your livestock safely inside. The square wire mesh is a little too large for smaller animals to remain contained. For example, smaller rabbits would pass through the fence. This fence can only be used for medium size animals. Large animals such as horses can jump over it and small animals like rabbits and poultry might go right through it. This product is specifically designed for horse enclosures. This wire fence can resist a force of 1250 lbs per strand without braking. Ultraviolet inhibitors protect the wires so that they remain durable and flexible. The Bayco Finish Line is light, easy to transport and easy to install. However, you must be prepared to sacrifice some time in order to complete the task. By using these wires to build your fence, you have the option to choose whatever kind of posts you want. Whether they are t-posts, wooden posts or plastic ones, the finished fence will look good and aesthetical while safely containing the horses. After installation, the fence is pretty much maintenance free. The fence will not sag over time and it will maintain its durability. Customers claim that not even fallen trees will break these wires. Even if the tree falls directly over the wire, it will most likely topple the posts instead of snapping the fence. The wire is extremely resistant and can hold big impact forces from horses as well as from other sources. The wire does not cut deep into the horse’s skin if it happens for the animal to hit the fence hard for whatever reason. This happens because the wire has a specially designed exterior surface. The fence roll is 2000 feet long so you have plenty of material to work with. You can build more than one horse enclosure. This model looks good with any type of posts you decide to use to construct your fence: wooden, t-posts, plastic, etc. Even if the job is simple, it may take more than one day to install this fence. Especially if you use wooden posts you must have additional power tools such as corded drills to drill multiple holes in them. This economical lightweight fence is a great choice for your gardening or enclosure projects. The metal was first galvanized and then coated in order to prolong its life and improve its durability. This translates to a product that virtually needs no maintenance after it’s installed. This product is 48 inches tall, made of 14 gauge steel and has a green color coating. This coating is a great feature as people who placed this fence around trees or rose gardens are extremely content with the fact that the fence is nearly invisible. 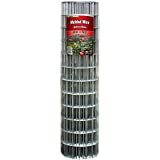 The item offers a great alternative to ornamental fencing and gardening solutions at a much lower price. The wire netting has consistent spaces of 2 inches by 3 inches. This is enough to keep most animals away from your vegetable or flower garden. Also, goats, sheep or guard dogs can be enclosed safely while predators such as coyotes are kept away. The fence is both galvanized and coated with green paint. These features give the product a long life and make it durable in bad weather. The green color exterior is a bonus as the fence doesn’t look out of place in a garden or outdoors in general. It blends with the scenery and sometimes it is almost invisible. After you install this fence you do not have to perform any maintenance work on it. It is fairly resilient and it’s not affected by corrosion. Compared to other fences this model is inexpensive and can successfully replace other gardening implements that cost more. The fence is not extremely resistant to powerful hits and may break if a great force is applied to it when transported or handled. The netting is not thick enough to prevent small animals such as mice, rats or other rodents from passing through it. The Origin Point Fence is 36 inches tall and 50 feet long. The materials out of which the fence is built are strong and durable. The 14 gauge wire is coated with black vinyl. This translates into a water-resistant surface. As the water doesn’t reach the metal mesh, the fence is rust resistant and can be installed anywhere outside without needing any additional protection measures. The fence features 2 by 4-inch openings. It is easy to handle and to reshape or resize with a simple wire cutter. This product can be used to enclose medium-sized animals such as goats, sheep, llamas, dogs, while simultaneously protecting them from predator animals such as wolves or coyotes. Beside animal enclosure, this fence has many other uses. Customers have placed it in gardens to support growing vegetables, have marked property boundaries and built flower beds from it. The surface of the netting is coated in black vinyl which protects the metal from moisture and therefore makes this item corrosion resistant. The fence can be installed on any type of ground and does not require any more maintenance work afterward. The roll found in the ordered package is light and can be handled and maneuvered even by old people who have back problems. The fence is extremely versatile and can be used in a multitude of home projects around and inside your garden, patio or near alleyways. The fence will not protect your vegetable or flower garden against rabbits, rats or mice as they manage to slip through the gaps in the netting. There is a small chance that you will receive a different product than what you order. Some customers received a different size fence. This welded fence is built with 14 gauge galvanized steel wire. It has an overall sturdy structure and the edges are smoothed out in order to prevent cuts and scrapes on humans and on animals as well. The fence features a 2 by 4 inch mesh small enough to prevent medium size animals from passing from one side to another. This product can be used to build animal enclosures, both to prevent them from escaping and to protect them as well. There are many other uses for such a product. People use the netting to help vegetables grow in their gardens or use it to pet-proof certain areas of their home. This kind of fence is suitable for property delimitation as well. As the material used is galvanized, you do not have to worry about humidity or rain after the fence is installed. The fence doesn’t require any maintenance after that point. The fence is protected against rust as the metal has been galvanized before welding, therefore you can safely leave it unattended in any weather. The edges are trimmed and smoothed so the installation process is simple and safe. In addition, no animal will get snagged if it runs near the wire mesh. Wolves and coyotes are kept away from your livestock as these medium size animals can’t pass through the 2 by 4 wire mesh. The mesh can be easily cut with wire cutters and repurposed for different home projects. People often use the netting in their garden to grow vegetables on it. The gray color may not look so aesthetically pleasing to the eye as opposed to other colors such as green. During transportation, some welds may come undone and will require mending. This also means that the structure is not very resistant to high-impact forces. If you are the owner of some animals, like for instance goats or sheep, you have to keep them enclosed. This will prevent your livestock from getting lost and equally important, will protect them from any predator that approaches from outside. The most elegant solution to this problem is to install a good goat fence. Here are your options regarding the posts and the fence you can use. T-posts come in different sizes and their length ranges from 4 feet to 8 feet. They are easy enough to find as they are sold in almost every local farm store. They do not take long to install, and the job is easy enough if you own a t-post driver or even just a sledgehammer. They are cheaper than many models of wooden posts, are durable and can be moved after installation. On the downside, aesthetically speaking, these t-posts are not as pleasing as wooden posts. Depending on where you live these posts may cost around 3 to 4 US dollars. They are cheaper than wooden posts and easier to transport. They are a quick solution for building a fence without spending a fortune. Treated wooden posts for fences come in sizes between 6 and 8 feet and are resistant to rot. Their shapes are regular, but they are heavier and harder to maneuver than other types of posts. In addition, you have to dig holes in the ground before placing them. Moreover, because they are treated with chemical substances that prolong their life span, they may pollute the soil. Wooden posts cost more at around 8 to 10 US dollars and can be purchased in more places than just a farm store. Although they look better, they are hard to remove and reinstall in other places and their chemical treatment makes these posts harmful to nature. Split locusts posts look extremely good due to their rustic apparel. They are not chemically treated and they can be found ranging in lengths between 6 and 8 feet. They have a natural resistance to humidity and a long life span. They can be purchased from many sources, even online, and their price varies. Some of them can be bought with 3 US dollars, which is less than t-posts. Step-in posts are mainly used in building temporary pastures. They are cheap, costing around 2 to 3 US dollars and easy to transport and install. You don’t have to buy additional materials and you can use just your foot to drive them into the ground. Regarding the fence, you have some options here as well. You can choose between the welded wire, woven wire, field fence, barbed wire, and electric wire. The welded fence is a cheap goat fence option and definitely less expensive than the others. However, this is less durable. It comes with different wire gauges and it’s a good solution for enclosing gardens, trees or even poultry if the netting spaces are small enough. The woven wire makes for strong, durable fences capable of withstanding goat, ram and cattle hits. Depending on the size of the animal that you want to keep, you should acquire a woven fence with different sized holes in it’s netting. For smaller animals, the spaces in the wiring pattern should be smaller so the animals don’t stick their head through it. Field fence is used to enclose large areas as it handles terrain changes with ease. However, it doesn’t resist high-force hits very well. Barbed wire is good for enclosing large animals such as cattle or bison. This type of fence is not suited for smaller animals such as llamas, alpacas or sheep as it’s not safe for them. It can be easily repaired and posts can be placed farther apart. This type of fence can be used in combination with other fences such as welded or woven ones. The electric wire is good for protecting your livestock from predators such as wolves, coyotes or even bears. It is flexible and easy to install and can be adapted so that you can enclose virtually any animals. It is a good choice both for medium size animals such as sheep or goats as well as for large animals like cattle or horses. This fence can have metal, wooden or PVC posts.